Switch Sencha Cmd Versions Any Time. ​Sometimes it is handy and necessary to change the Sencha Cmd version without having to play around with your path and hand-juggle multiple versions. Here are some simple steps to check which version is running, see which versions you have installed and finally a step to actually change the currently running version. Successfully switched to version 6.0.1.76. Run 'sencha help' to see the available commands on this version. 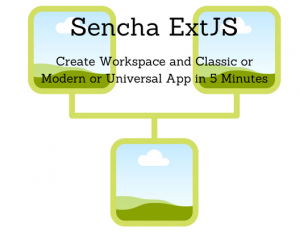 Sencha tooling with npm has been announced for Ext JS 6.6. This is awesome news! This post is partly news item and partly tutorial. As of June 4, 2018, Sencha made an early version of their new tooling available to their MVPs. As a member of that group, I wanted to share some state-of-the-moment news and information for the new npm based Sencha tooling. To learn about the Sencha MVP program and to become an MVP yourself, checkout this link: Sencha MVP Program. Ext JS 6.6 is on the horizon and with the new release comes node packaging and node tooling to build your application. See this link for a detailed discussion: Top Considerations for Web Development in a Free Open Source World. This is super exciting because the same npm based build concepts in use with React, Angular and other frameworks are now in beta for Ext JS Modern and Classic. Hooray!! This breaks us out of the Sencha Cmd silo and makes Ext JS feel a lot more open. Determine the the version of node and npm currently available here. Get npm here if you don’t have it. Your Sencha forum user id and password is required to get access – but first you must be a member of the Sencha MVP Program. When prompted for user id, use your sencha support id, but replace the (at sign) @ sign in your email address with (two dots) .. Depending on your setup, for mac or linux, you may need to run with sudo. The above screenshot shows what you will see after a successful installation. Below, is an easier to read and copyable version of the screenshot above. I conducted some tests based on the above examples and they were all successful. They all built successfully and ran as expected. The -i or –interactive options prompt for the template type but does not (yet?) prompt for the theme. Below is the output from the ext-gen –help with some color coding to draw your attention to the current list of templates and themes. Think of templates as the type of app you are wanting to create: classicdesktop, moderndesktop, universalclassicmodern, universalmodern – see the template descriptions in red below for more details. Themes are out-of-the box ways to effect and control the look of the app. Here is a list of the stock themes available in Ext JS 6.5.3 (not sure if this is the same list that will be available for Ext JS 6.6 or not). There is a lot to say about themes, creating custom themes and so forth that are beyond the scope of this article but I’m sure Sencha will move this forward the way they always have. universalmodernThis template contains 2 profiles, 1 for desktop and 1 for mobile. Both profiles use the modern toolkit. And finally, here are the npm commands I used to build for testing and production the way Sencha Cmd has historically done. cd into the app folder and execute the appropriate build command. This is a brief state-of-the moment look at npm for Ext JS. I’m excited to see what comes next and I will continue to provide updates as things move along. Check out Pinch Hitter Solutions at phs4j.com. Check out Scott's youtube channel at Motivated Code Pro.